So now that I have a chance to catch my breath and bake again, I’m excited to share a bit about my trip to New York. I thought these cookies would be perfect to serve you while we talk about dairy, since they are best with a nice cold glass of milk. They’re rich. The American Dairy Association North East hosted a group of bloggers and nutritionists on a two day event in New York. We toured Yancey’s Fancy artisan cheese plant and learned about the process of cheese making (and sample some delicious cheeses like steakhouse onion, yum!) Did you know 1/3 of the milk produced in the country is made into cheese! It’s safe to say American’s love their cheese! Even though it was a rainy day, we braved the weather and toured an operating dairy, learning about how the cows are cared for and some state-of-the-art sustainability practices such as a methane digester, which process the manure into power. We ended the trip with a little friendly competition, the Macaroni and Cheese Throw Down. I felt a little bit like a competitor on Chopped, but we were allowed to choose all of our ingredients and had more time 🙂 . I made a loaded baked potato macaroni and cheese, with bacon Gouda. The winner made a dill pickle hamburger macaroni and cheese. I wish I would have got to taste it, but I heard it was delicious! As a farmer’s daughter, I’m excited about the work that the Dairy Association does in educating consumers on how their dairy products are grown and produced. We live in an age where the public is distanced from the source of their food and many have never seen an animal on a farm. It is important for the farmers to bring customers alongside their operations and build trust in the food they are producing. So as your enjoying that nice glass of milk with your cookie, thank a farmer! Traditional chocolate chip cookies dipped in a layer of dark chocolate. 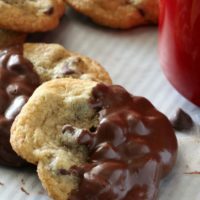 They're a chocolate lover's dream. Be sure to enjoy with a glass of milk. 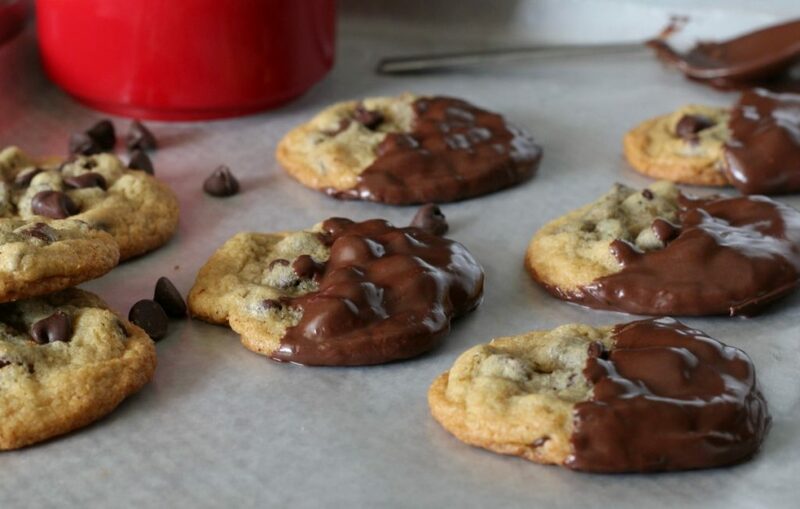 Make the best chocolate chip cookies ever! And let them cool completely. 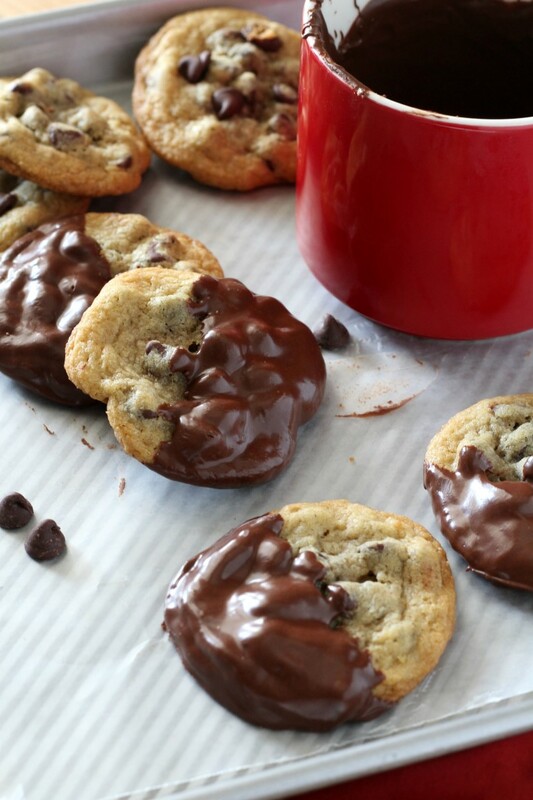 The recipe makes for dozen, but you'll only need two dozen to dip. 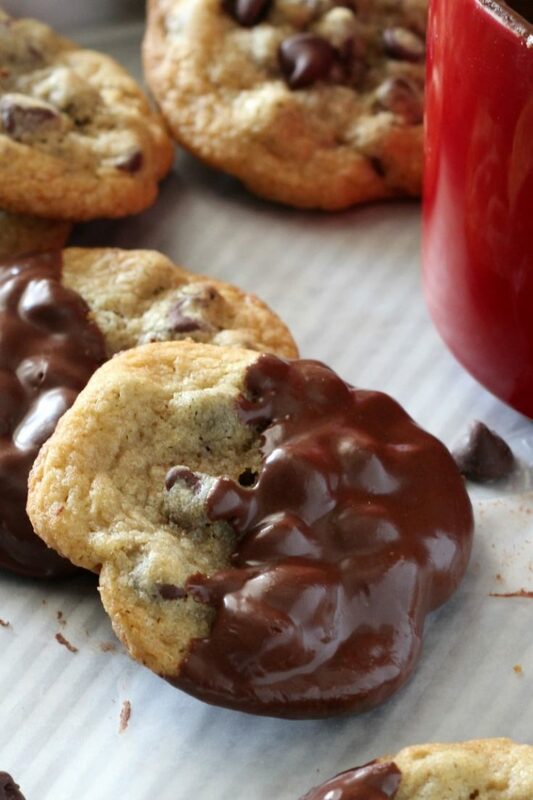 Or double the chocolate and dip them all. Roughly chop the chocolate and place into a microwavable glass bowl with the shortening. Microwave in 10 second increments, stirring in between until the chocolate it melted and smooth. 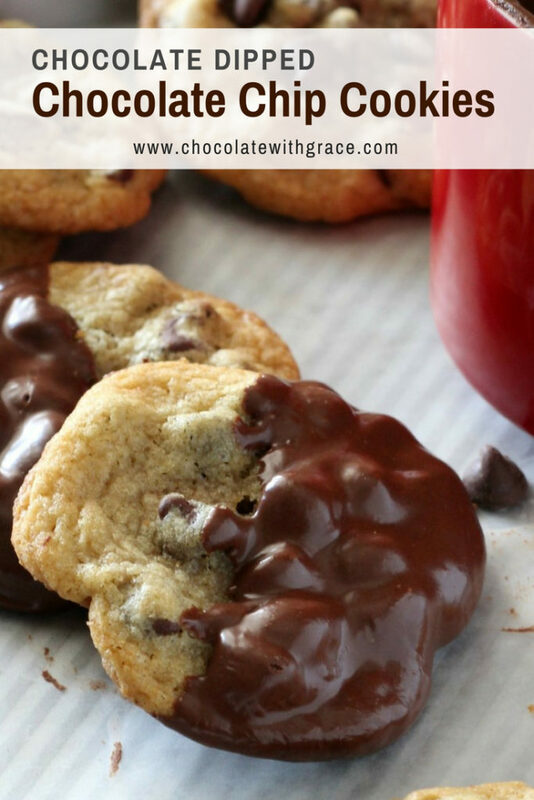 Dip the each cookie halfway into the chocolate and let harden completely on wax paper. Serve with milk. 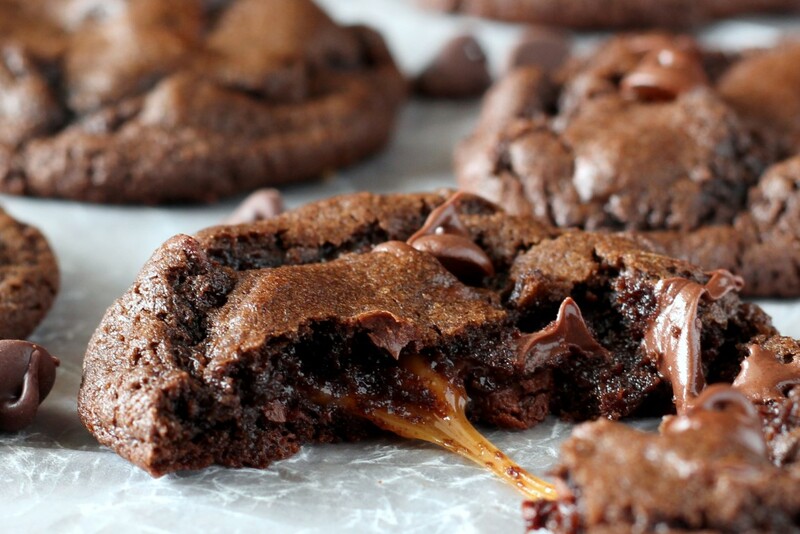 If you’re looking for another crazy good cookie, try these Caramel Stuffed Double Chocolate Cookies. I don’t care about how “busy” October was. Try working 12 hour shifts 6 days a week, then talk to me about being busy. I don’t care about your trip to New York. I don’t care that your a “farmers daughter”, And touching on my first point, how are you ever busy? You make food and take pictures of it. I guess now that I think about it since you feel obliged to include an autobiography in front of ever recipe I can see where that would take a while. If a man had done this it would be short, sweet, and to the point. But a man truly wouldn’t have time because he would be at his JOB making money. Money that he would use to pay for his wife’s website so she would spend all of her time taking pictures of food, with an expensive camera that he probably also bought, so she would always be preoccupied and not bugging him. Great recipe though. 10/10. Glad you liked them Megan. How hard is it to just not read this woman’s blog? I could care less if you think it’s easy or not, your comments are unwarranted. If you feel that strongly about her page, then click the X in the corner and be gone…bit of a drama over a recipe isn’t it? Also, keep the sexism and stereotypes to yourself mama. There’s enough hate in the world, chill out. It’s clear you have something else going on and these cookies were the trigger ?? Wow, Megan. Are you ok? I hope you find peace in your life.